I’ve been reading books and articles using various apps on my iPad for years. I’ve even used a Kobo for a little while. It’s much slower and less capable (and much less expensive), but the good folks at Kobo did not cheap out on one important feature it shares with the iPad: a dictionary. Just tap a word and you can easily look up its meaning. I’m thinking about this seemingly mundane feature these days because I’m rededicating myself to learning the craft of translation. Why? This Toronto-born and dwelling writer aims to increase work and other experiences in his daily life in languages other than English. I would like to welcome (sic) to the course as you have passed the entrance exam despite some minor problems in your French composition. Please feel free to continue with the course by following the instructions. Please note that the benchmark composition is not marked by the instructor, as it is not counted towards your final grade. However, I took the freedom to highlight a few mistakes in your texts (yellow for grammatical and lexical errors and purple for style and diction imperfections). At this stage, no further explanation is offered about these errors considering that the compositions are not a part of your assignments and the fact that our course is not a language course but one on translation. Nevertheless, it is important to remember that these mistakes cost a lot of marks if made in an assignment or in the final exam. Please note that students can discuss their problems and ask their questions in class (during the webinar). I look forward to seeing you in our first webinar. I speak four languages and I value communications in each one. I want to use each language more in my daily life. How I’m dealing with this challenge differs from the way I shied away from similar events as a younger person. The instructor essentially told me I need to put extra effort into this course, and I’ve been coming up with ways to do that. One way is talking through my concerns with friends who have languages and translation experience. They’ve been fantastic and supportive. One, born in France and working as a teacher in Toronto, leant me a number of books she used as a translator and French teacher. Reading Le Soleil every day exposed me to new French terms and phrases and ways of expressing oneself. But it was a pain to go to the huge Harrap’s Shorter French-English dictionary I had on my desk to look up words I didn’t understand. Harrap’s is a great resource. It’s also a brick, and if it’s “shorter” I could probably bench press the regular-sized Harrap’s. Now, more than two decades later, I just need to touch a word in an article inside an app. For some reason, La Presse, in its wisdom. requires three taps to look up a definition instead of the two needed in other “reader” apps. I’m patient, grateful as I am to resume this daily French reading habit on a fine news app. 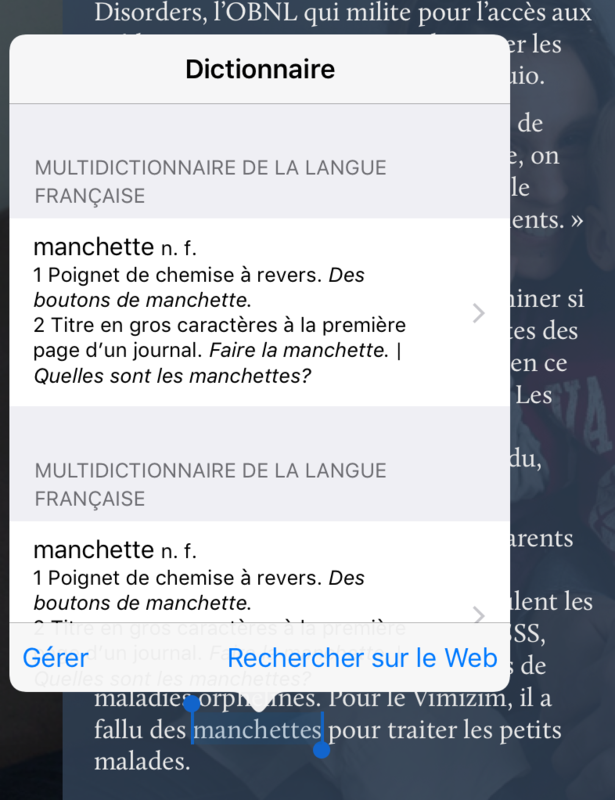 The iPad’s dictionary calls up the French definition first, and I can scroll through entries from the different dictionaries Apple thoughtfully included with the iPad. I’m also increasingly using the three-finger tap on my macOS Sierra-endowed MacBook Pro to get definitions on my computer. The Mac also has its own Dictionary.app that includes various language dictionaries, a thesaurus, and more. The Harraps Shorter is gathering dust. I’m sure there’s something similar on Android tablets and Windows and Chrome computers, but I haven’t bothered to check them out. Make no mistake. Improving one’s language skills to the degree I’m aiming for is meant for people who have passion for the project and are humble enough to realize the task is never-ending. Electronic dictionaries don’t do the job for you. But they do lighten the load.